Daytrana should be given cautiously to patients with a history of drug dependence or alcoholism. Chronic abusive use can lead to marked tolerance and psychological dependence with varying degrees of abnormal behavior. Frank psychotic episodes can occur, especially with parenteral abuse. Careful supervision is required during withdrawal from abusive use, since severe depression may occur. Withdrawal following chronic therapeutic use may unmask symptoms of the underlying disorder that may require follow-up. These highlights do not include all the information needed to use Daytrana® safely and effectively. See full prescribing information for Daytrana. Daytrana should be given cautiously to patients with a history of drug dependence or alcoholism. Chronic abusive use can lead to marked tolerance and psychological dependence with varying degrees of abnormal behavior. Children (ages 6-12): The most commonly (â‰¥5% and twice the rate of placebo) reported adverse reactions in a placebo-controlled trial in children aged 6-12 included appetite decreased, insomnia, nausea, vomiting, weight decreased, tic, affect lability, and anorexia ( 6.1). Adolescents (ages 13-17): The most commonly (â‰¥5% and twice the rate of placebo) reported adverse reactions in a placebo-controlled trial in adolescents aged 13-17 included appetite decreased, nausea, insomnia, weight decreased, dizziness, abdominal pain, and anorexia. The majority of subjects in these trials had erythema at the application site ( 6.1). The most common (â‰¥2% of subjects) adverse reaction associated with discontinuations in controlled clinical trials in children or adolescents was application site reactions ( 6.1). To report SUSPECTED ADVERSE REACTIONS, contact Noven Therapeutics, LLC at 1-877-567-7857 or FDA at 1-800-FDA-1088 or www.fda.gov/medwatch. Daytrana (methylphenidate transdermal system) is indicated for the treatment of Attention Deficit Hyperactivity Disorder (ADHD). The efficacy of Daytrana in patients diagnosed with ADHD was established in two 7-week controlled clinical trials in children (ages 6-12) and one 7-week, controlled clinical trial in adolescents (ages 13-17). A diagnosis of ADHD (DSM-IV-TR®) implies the presence of hyperactive-impulsive or inattentive symptoms that caused impairment and were present before age 7 years. The symptoms must cause clinically significant impairment, e.g., in social, academic, or occupational functioning, and be present in two or more settings, e.g., school (or work) and at home. The symptoms must not be better accounted for by another mental disorder. For the Inattentive Type, at least six of the following symptoms must have persisted for at least 6 months: lack of attention to details/careless mistakes; lack of sustained attention; poor listener; failure to follow through on tasks; poor organization; avoids tasks requiring sustained mental effort; loses things; easily distracted; forgetful. For the Hyperactive-Impulsive Type, at least six of the following symptoms must have persisted for at least 6 months: fidgeting/squirming; leaving seat; inappropriate running/climbing; difficulty with quiet activities; "on the go;" excessive talking; blurting answers; can't wait turn; intrusive. The Combined Type requires both inattentive and hyperactive-impulsive criteria to be met. The specific etiology of this syndrome is unknown, and there is no single diagnostic test. Adequate diagnosis requires the use not only of medical but of special psychological, educational, and social resources. Learning may or may not be impaired. The diagnosis must be based upon a complete history and evaluation of the patient and not solely on the presence of the required number of DSM-IV-TR® characteristics. Daytrana is indicated as an integral part of a total treatment program for ADHD that may include other measures (psychological, educational, social) for patients with this syndrome. Drug treatment may not be indicated for all patients with this syndrome. Stimulants are not intended for use in the patient who exhibits symptoms secondary to environmental factors and/or other primary psychiatric disorders, including psychosis. Appropriate educational placement is essential and psychosocial intervention is often helpful. When remedial measures alone are insufficient, the decision to prescribe stimulant medication will depend upon the physician's assessment of the chronicity and severity of the patient's symptoms. Daytrana is contraindicated in patients known to be hypersensitive to methylphenidate or other components of the product (polyester/ethylene vinyl acetate laminate film backing, acrylic adhesive, silicone adhesive, and fluoropolymer-coated polyester) [ see Description (11.1)] . Daytrana is contraindicated in patients with marked anxiety, tension, and agitation, since the drug may aggravate these symptoms. Daytrana is contraindicated in patients with glaucoma. Daytrana is contraindicated in patients with motor tics or with a family history or diagnosis of Tourette's syndrome [ see Adverse Reactions (6.1)] . Daytrana is contraindicated during treatment with monoamine oxidase inhibitors, and also within a minimum of 14 days following discontinuation of treatment with a monoamine oxidase inhibitor (hypertensive crises may result). Stimulant medications cause a modest increase in average blood pressure (about 2-4 mmHg) and average heart rate (about 3-6 bpm), and individuals may have larger increases. While the mean changes alone would not be expected to have short-term consequences, all patients should be monitored for larger changes in heart rate and blood pressure. Caution is indicated in treating patients whose underlying medical conditions might be compromised by increases in blood pressure or heart rate, e.g., those with pre-existing hypertension, heart failure, recent myocardial infarction, or ventricular arrhythmia [ see Adverse Reactions (6.1)] . Treatment emergent psychotic or manic symptoms, e.g., hallucinations, delusional thinking, or mania in children and adolescents without a prior history of psychotic illness or mania can be caused by stimulants at usual doses. If such symptoms occur, consideration should be given to a possible causal role of the stimulant, and discontinuation of treatment may be appropriate. In a pooled analysis of multiple short term, placebo-controlled studies, such symptoms occurred in about 0.1% (4 patients with events out of 3,482 exposed to methylphenidate or amphetamine for several weeks at usual doses) of stimulant-treated patients compared to none in placebo-treated patients. Daytrana use may result in a persistent loss of skin pigmentation at and around the application site. Loss of pigmentation, in some cases, has been reported at other sites distant from the application site. Chemical leukoderma can mimic the appearance of vitiligo, particularly when the loss of skin pigmentation involves areas distant from the application site. Individuals with a history of vitiligo and/or a family history of vitiligo may be more at risk. Skin depigmentation may persist even after Daytrana use is discontinued. Monitor for signs of skin depigmentation, and advise patients to immediately inform their healthcare provider if changes in skin pigmentation occur. Discontinue the Daytrana patch in patients with chemical leukoderma. In an open-label study of 305 subjects conducted to characterize dermal reactions in children with ADHD treated with Daytrana using a 9-hour wear time, one subject (0.3%) was confirmed by patch testing to be sensitized to methylphenidate (allergic contact dermatitis). This subject experienced erythema and edema at Daytrana application sites with concurrent urticarial lesions on the abdomen and legs resulting in treatment discontinuation. This subject was not transitioned to oral methylphenidate. Use of Daytrana may lead to contact sensitization. Daytrana should be discontinued if contact sensitization is suspected. Erythema is commonly seen with use of Daytrana and is not by itself an indication of sensitization. However, contact sensitization should be suspected if erythema is accompanied by evidence of a more intense local reaction (edema, papules, vesicles) that does not significantly improve within 48 hours or spreads beyond the patch site. Confirmation of a diagnosis of contact sensitization (allergic contact dermatitis) may require further diagnostic testing. Patients sensitized from use of Daytrana, as evidenced by development of an allergic contact dermatitis, may develop systemic sensitization or other systemic reactions if methylphenidate-containing products are taken via other routes, e.g., orally. Manifestations of systemic sensitization may include a flare-up of previous dermatitis or of prior positive patch-test sites, or generalized skin eruptions in previously unaffected skin. Other systemic reactions may include headache, fever, malaise, arthralgia, diarrhea, or vomiting. No cases of systemic sensitization have been observed in clinical trials of Daytrana. Patients who develop contact sensitization to Daytrana and require oral treatment with methylphenidate should be initiated on oral medication under close medical supervision. It is possible that some patients sensitized to methylphenidate by exposure to Daytrana may not be able to take methylphenidate in any form. Patients should be advised to avoid exposing the Daytrana application site to direct external heat sources, such as hair dryers, heating pads, electric blankets, heated water beds, etc., while wearing the patch. When heat is applied to Daytrana after patch application, both the rate and extent of absorption are significantly increased. The temperature-dependent increase in methylphenidate absorption can be greater than 2-fold [ see Clinical Pharmacology (12.3)] . This increased absorption can be clinically significant and can result in overdose of methylphenidate [ see Overdosage (10)] . The most commonly reported (frequency â‰¥ 5% and twice the rate of placebo) adverse reactions in a controlled trial in children aged 6-12 included appetite decreased, insomnia, nausea, vomiting, weight decreased, tic, affect lability, and anorexia. The most commonly reported (frequency â‰¥ 5% and twice the rate of placebo) adverse reactions in a controlled trial in adolescents aged 13-17 were appetite decreased, nausea, insomnia, weight decreased, dizziness, abdominal pain, and anorexia [ see Adverse Reactions (6.1)] . The most common (â‰¥ 2% of subjects) adverse reaction associated with discontinuations in double-blind clinical trials in children or adolescents was application site reactions [ see Adverse Reactions (6.1)] . The overall Daytrana development program included exposure to Daytrana in a total of 2,152 participants in clinical trials, including 1,529 children aged 6-12, 223 adolescents aged 13-17, and 400 adults. The 1,752 child and adolescent subjects aged 6-17 years were evaluated in 10 controlled clinical studies, 7 open-label clinical studies, and 5 clinical pharmacology studies. In a combined studies pool of children using Daytrana with a wear time of 9 hours, 212 subjects were exposed for â‰¥ 6 months and 115 were exposed for â‰¥ 1 year; 85 adolescents have been exposed for â‰¥ 6 months. Most patients studied were exposed to Daytrana patch sizes of 12.5 cm 2, 18.75 cm 2, 25 cm 2 or 37.5 cm 2, with a wear time of 9 hours. In the data presented below, the adverse reactions reported during exposure were obtained primarily by general inquiry at each visit, and were recorded by the clinical investigators using terminology of their own choosing. Consequently, it is not possible to provide a meaningful estimate of the proportion of individuals experiencing adverse reactions without first grouping similar types of events into a smaller number of standardized event categories. Throughout this section adverse reactions reported are events that were considered to be reasonably associated with the use of Daytrana based on comprehensive assessment of the available adverse event information. A causal association for Daytrana often cannot be reliably established in individual cases. Further, adverse reaction rates observed in the clinical trials of a drug cannot be directly compared to rates in clinical trials of another drug and may not reflect the rates observed in clinical practice. In a 7-week double-blind, parallel-group, placebo-controlled study in children with ADHD conducted in the outpatient setting, 7.1% (7/98) of patients treated with Daytrana discontinued due to adverse events compared with 1.2% (1/85) receiving placebo. The most commonly reported (â‰¥ 1% and twice the rate of placebo) adverse reactions leading to discontinuation in the Daytrana group were application site reaction (2%), tics (1%), headache (1%), and irritability (1%). In a 7-week double-blind, parallel-group, placebo-controlled study in adolescents with ADHD conducted in the outpatient setting, 5.5% (8/145) of patients treated with Daytrana discontinued due to adverse reactions compared with 2.8% (2/72) receiving placebo. The most commonly reported adverse reactions leading to discontinuation in the Daytrana group were application site reaction (2%) and decreased appetite/anorexia (1.4%). Daytrana is a dermal irritant. In addition to the most commonly reported adverse reactions presented in Table 2, the majority of subjects in those studies had minimal to definite skin erythema at the patch application site. This erythema generally caused no or minimal discomfort and did not usually interfere with therapy or result in discontinuation from treatment. Erythema is not by itself a manifestation of contact sensitization. However, contact sensitization should be suspected if erythema is accompanied by evidence of a more intense local reaction (edema, papules, vesicles) that does not significantly improve within 48 hours or spreads beyond the patch site [ see Warnings and Precautions (5.8)]. Table 2 lists treatment-emergent adverse reactions reported in â‰¥ 1% Daytrana-treated children or adolescents with ADHD in two 7 week double-blind, parallel-group, placebo-controlled studies conducted in the outpatient setting. Overall, in these studies, 75.5% of children and 78.6% of adolescents experienced at least 1 adverse event. In a long-term open-label study of up to 12 months duration in 326 children wearing Daytrana 9 hours daily, the most common (â‰¥ 10%) adverse reactions were decreased appetite, headache, and weight decreased. A total of 30 subjects (9.2%) were withdrawn from the study due to adverse events and 22 additional subjects (6.7%) discontinued treatment as the result of an application site reaction. Other than application site reactions, affect lability (5 subjects, 1.5%) was the only additional adverse reaction leading to discontinuation reported with a frequency of greater than 1%. In a long-term open-label study of up to 6 months duration in 162 adolescents wearing Daytrana 9 hours daily, the most common (â‰¥ 10%) adverse reactions were decreased appetite and headache. A total of 9 subjects (5.5%) were withdrawn from the study due to adverse events and 3 additional subjects (1.9%) discontinued treatment as the result of an application site reaction. Other adverse reactions leading to discontinuation that occurred with a frequency of greater than 1% included affect lability and irritability (2 subjects each, 1.2%). In addition, the following adverse reactions have been identified during the postapproval use of Daytrana. Because these reactions are reported voluntarily from a population of uncertain size, it is not possible to reliably estimate their frequency or establish a causal relationship to Daytrana exposure. General Disorders and Administration Site Disorders: fatigue, application site reactions such as bleeding, bruising, burn, burning, dermatitis, discharge, discoloration, discomfort, dryness, eczema, edema, erosion, erythema, excoriation, exfoliation, fissure, hyperpigmentation, hypopigmentation, induration, infection, inflammation, irritation, pain, papules, paresthesia, pruritus, rash, scab, swelling, ulcer, urticaria, vesicles, and warmth. Neuroleptic Malignant Syndrome: Very rare reports of neuroleptic malignant syndrome (NMS) have been received, and, in most of these, patients were concurrently receiving therapies associated with NMS. In a single report, a ten-year-old boy who had been taking methylphenidate for approximately 18 months experienced an NMS-like event within 45 minutes of ingesting his first dose of venlafaxine. It is uncertain whether this case represented a drug-drug interaction, a response to either drug alone, or some other cause. Daytrana should not be used in patients being treated (currently or within the preceding two weeks) with monoamine oxidase inhibitors [ see Contraindications (4.5)]. Because of a possible effect on blood pressure, Daytrana should be used cautiously with pressor agents. Human pharmacologic studies have shown that methylphenidate may inhibit the metabolism of coumarin anticoagulants, anticonvulsants (e.g., phenobarbital, phenytoin, primidone), and some tricyclic drugs (e.g., imipramine, clomipramine, desipramine) and selective serotonin reuptake inhibitors. Downward dose adjustments of these drugs may be required when given concomitantly with methylphenidate. It may be necessary to adjust the dosage and monitor plasma drug concentrations (or, in the case of coumarin, coagulation times), when initiating or discontinuing methylphenidate. Pregnancy Category C - Animal reproduction studies with transdermal methylphenidate have not been performed. In a study in which oral methylphenidate was given to pregnant rabbits during the period of organogenesis at doses up to 200 mg/kg/day no teratogenic effects were seen, although an increase in the incidence of a variation, dilation of the lateral ventricles, was seen at 200 mg/kg/day; this dose also produced maternal toxicity. A previously conducted study in rabbits showed teratogenic effects of methylphenidate at an oral dose of 200 mg/kg/day. In a study in which oral methylphenidate was given to pregnant rats during the period of organogenesis at doses up to 100 mg/kg/day, no teratogenic effects were seen although a slight delay in fetal skeletal ossification was seen at doses of 60 mg/kg/day and above; these doses caused some maternal toxicity. In a study in which oral methylphenidate was given to rats throughout pregnancy and lactation at doses up to 60 mg/kg/day, offspring weights and survival were decreased at 40 mg/kg/day and above; these doses caused some maternal toxicity. Adequate and well-controlled studies in pregnant women have not been conducted. Daytrana should be used during pregnancy only if the potential benefit justifies the potential risk to the fetus. The effect of Daytrana on labor and delivery in humans is unknown. It is not known whether methylphenidate is excreted in human milk. Daytrana should be administered to a nursing woman only if the potential benefit justifies the potential risk to the child. Daytrana should not be used in children under six years of age, since safety and efficacy in this age group have not been established. Long-term effects of methylphenidate in children have not been well established. Studies with transdermal methylphenidate have not been performed in juvenile animals. In a study conducted in young rats, methylphenidate was administered orally at doses of up to 100 mg/kg/day for 9 weeks, starting early in the postnatal period (Postnatal Day 7) and continuing through sexual maturity (Postnatal Week 10). When these animals were tested as adults (Postnatal Weeks 13-14), decreased spontaneous locomotor activity was observed in males and females previously treated with 50 mg/kg/day or greater, and a deficit in the acquisition of a specific learning task was seen in females exposed to the highest dose. The no effect level for juvenile neurobehavioral development in rats was 5 mg/kg/day. The clinical significance of the long-term behavioral effects observed in rats is unknown. Daytrana has not been studied in patients greater than 65 years of age. Daytrana is classified as a Schedule II controlled substance by federal regulation. See warning containing drug abuse information [ see Boxed Warning]. See warning containing drug dependence information [ see Boxed Warning]. Signs and symptoms of acute methylphenidate overdosage, resulting principally from overstimulation of the CNS and from excessive sympathomimetic effects, may include the following: vomiting, agitation, tremors, hyperreflexia, muscle twitching, convulsions (may be followed by coma), euphoria, confusion, hallucinations, delirium, sweating, flushing, headache, hyperpyrexia, tachycardia, palpitations, cardiac arrhythmias, hypertension, mydriasis, dryness of mucous membranes, and rhabdomyolysis. Remove all patches immediately and cleanse the area(s) to remove any remaining adhesive. The continuing absorption of methylphenidate from the skin, even after removal of the patch, should be considered when treating patients with overdose. Treatment consists of appropriate supportive measures. The patient must be protected against self-injury and against external stimuli that would aggravate overstimulation already present. Intensive care must be provided to maintain adequate circulation and respiratory exchange; external cooling procedures may be required for hyperpyrexia. Efficacy of peritoneal dialysis or extracorporeal hemodialysis for Daytrana overdosage has not been established. As with the management of all overdosages, the possibility of multiple drug ingestion should be considered. The physician may wish to consider contacting a poison control center for up-to-date information on the management of overdosage with methylphenidate. Daytrana contains methylphenidate in a multipolymeric adhesive. The methylphenidate is dispersed in acrylic adhesive that is dispersed in a silicone adhesive. The composition per unit area of all dosage strengths is identical, and the total dose delivered is dependent on the patch size and wear time. The patch consists of three layers, as seen in the figure below (cross-section of the patch). Proceeding from the outer surface toward the surface adhering to the skin, the layers are (1) a polyester/ethylene vinyl acetate laminate film backing, (2) a proprietary adhesive formulation incorporating Noven Pharmaceuticals, Inc.'s DOT Matrixâ„¢ transdermal technology consisting of an acrylic adhesive, a silicone adhesive, and methylphenidate, and (3) a fluoropolymer-coated polyester protective liner which is attached to the adhesive surface and must be removed before the patch can be used. The active component of the patch is methylphenidate. The remaining components are pharmacologically inactive. Methylphenidate is a CNS stimulant. Its mode of therapeutic action in Attention Deficit Hyperactivity Disorder (ADHD) is not known, but methylphenidate is thought to block the reuptake of norepinephrine and dopamine into the presynaptic neuron and to increase the release of these monoamines into the extraneuronal space. 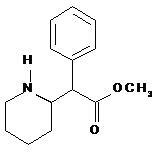 Methylphenidate is a racemic mixture comprised of the d-and l-enantiomers. The d-enantiomer is more pharmacologically active than the l-enantiomer. The pharmacokinetics of Daytrana when applied to the hip for 9 hours have been studied in ADHD patients 6 to 17 years old. The amount of methylphenidate absorbed systemically is a function of both wear time and patch size. In patients with ADHD, peak plasma levels of methylphenidate are reached at about 10 hours after single application and 8 hours after repeat patch applications (12.5cm 2 to 37.5cm 2) when worn up to 9 hours. On single dosing with Daytrana to children or adolescents, there was a delay of, on average, 2 hours before d-methylphenidate was detectable in the circulation. On repeat dosing, low concentrations (1.2-3.0 ng/mL in children and 0.5-1.7ng/mL in adolescents, on average across the dose range) were observed earlier in the profile, due to carry-over effect. Following the application of Daytrana once daily with a 9 hour wear time, the mean pharmacokinetic parameters of d-methylphenidate in children and adolescents with ADHD after 4 weeks of therapy are summarized in Table 3. Following administration of Daytrana 12.5cm 2 to pediatric and adolescent ADHD patients daily for 7 days, there were 13% and 14% increases, respectively, in steady state area under the plasma concentration-time curve (AUC ss) relative to that anticipated on the basis of single dose pharmacokinetics (AUC0 -âˆž); after 28 days administration, these increments increased to 64% and 76%, respectively. C max increased by nearly 69% and 100% within 4 weeks of daily administration of the starting dose in children and adolescents, respectively. The observed exposures with Daytrana could not be explained by drug accumulation predicted from observed single dose pharmacokinetics and there was no evidence that clearance or rate of elimination changed between single and repeat dosing. Neither were they explainable by differences in dosing patterns between treatments, age, race, or gender. This suggests that transdermal absorption of methylphenidate may increase with repeat dosing with Daytrana; on average, steady-state is likely to have been achieved by approximately 14 days of dosing. In the single- and multiple dose study described above, exposure to l-methylphenidate was 46% of the exposure to d-methylphenidate in children and 40% in adolescents. l-methylphenidate is less pharmacologically active than d-methylphenidate [ see Pharmacodynamics (12.2)] . In a phase 2 PK/PD study in children aged 6-12 years, 2/3 of patients had 2-hour d-MPH concentrations < 5 ng/mL on chronic dosing, and at 3 hours 40% of patients had d-MPH concentrations < 5 ng/mL [ see Clinical Studies (14)] . When Daytrana is applied to inflamed skin both the rate and extent of absorption are increased as compared with intact skin. When applied to inflamed skin, lag time is no greater than 1 hour, T max is 4 hours, and both C max and AUC are approximately 3-fold higher. When heat is applied to Daytrana after patch application, both the rate and the extent of absorption are significantly increased. Median T lag occurs 1 hour earlier, T max occurs 0.5 hours earlier, and median C max and AUC are 2-fold and 2.5-fold higher, respectively. Application sites other than the hip can have different absorption characteristics and have not been adequately studied in safety or efficacy studies. Following a single 9-hour application of Daytrana patch doses of 10 mg / 9 hours to 30 mg / 9 hours patches to 34 children with ADHD, C max and AUC 0-t of d-methylphenidate were proportional to the patch dose. Mean plasma concentration-time plots are shown in Figure 1. C max of l-methylphenidate was also proportional to the patch dose. AUC 0-t of l-methylphenidate was only slightly greater than proportional to patch dose. Upon removal of Daytrana, methylphenidate plasma concentrations in children with ADHD decline in a biexponential manner. This may be due to continued distribution of MPH from the skin after patch removal. Methylphenidate is metabolized primarily by de-esterification to alpha-phenyl-piperidine acetic acid (ritalinic acid), which has little or no pharmacologic activity. Transdermal administration of methylphenidate exhibits much less first pass effect than oral administration. Consequently, a much lower dose of Daytrana on a mg/kg basis compared to oral dosages may still produce higher exposures of d-MPH with transdermal administration compared to oral administration. In addition, very little, if any, l-methylphenidate is systemically available after oral administration due to first pass metabolism, whereas after transdermal administration of racemic methylphenidate exposure to l-methylphenidate is nearly as high as to d-methylphenidate. The mean elimination t 1/2 from plasma of d-methylphenidate after removal of Daytrana in children aged 6 to 12 years and adolescents aged 13-17 years was approximately 4 to 5 hours. The t 1/2 of l-methylphenidate was shorter than for d-methylphenidate and ranged from 1.4 to 2.9 hours, on average. The C max and AUC of d-methylphenidate were approximately 50% lower in adolescents, compared to children, following either a 1-day or 7-day administration of Daytrana (10mg/9hr). 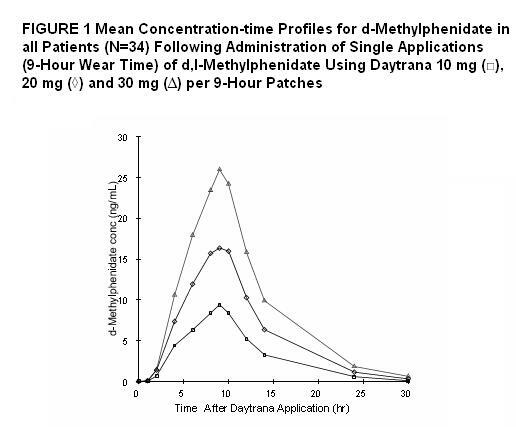 Multiple-dose administration of Daytrana did not result in significant accumulation of methylphenidate; following 7 days of Daytrana administration (10mg/9hr) in children and adolescents, the accumulation index of methylphenidate was 1.1, based on the mean steady state area under the plasma concentration-time curve (AUC ss) relative to that anticipated on the basis of single dose pharmacokinetics (AUC 0-âˆž). The pharmacokinetics or the pharmacodynamic food effect performance after application of Daytrana has not been studied, but because of the transdermal route of administration, no food effect is expected. The pharmacokinetics of methylphenidate after single and repeated doses of Daytrana were similar between boys and girls with ADHD, after allowance for differences in body weight. The influence of race on the pharmacokinetics of methylphenidate after administration of Daytrana has not been defined. The pharmacokinetics of methylphenidate after administration of Daytrana have not been studied in children less than 6 years of age. There is no experience with the use of Daytrana in patients with renal insufficiency. There is no experience with the use of Daytrana in patients with hepatic insufficiency. Carcinogenicity studies of transdermal methylphenidate have not been performed. In a lifetime carcinogenicity study of oral methylphenidate carried out in B6C3F1 mice, methylphenidate caused an increase in hepatocellular adenomas and, in males only, an increase in hepatoblastomas, at a daily dose of approximately 60 mg/kg/day. Hepatoblastoma is a relatively rare rodent malignant tumor type. There was no increase in total malignant hepatic tumors. The mouse strain used is sensitive to the development of hepatic tumors and the significance of these results to humans is unknown. Orally administered methylphenidate did not cause any increases in tumors in a lifetime carcinogenicity study carried out in F344 rats; the highest dose used was approximately 45 mg/kg/day. In a 24-week oral carcinogenicity study in the transgenic mouse strain p53 +/-, which is sensitive to genotoxic carcinogens, there was no evidence of carcinogenicity. In this study, male and female mice were fed diets containing the same concentration of methylphenidate as in the lifetime carcinogenicity study; the high-dose groups were exposed to 60 to 74 mg/kg/day of methylphenidate. Methylphenidate was not mutagenic in the in vitro Ames reverse mutation assay or in the in vitro mouse lymphoma cell forward mutation assay, and was negative in vivo in the mouse bone marrow micronucleus assay. Sister chromatid exchanges and chromosome aberrations were increased, indicative of a weak clastogenic response, in an in vitro assay in cultured Chinese hamster ovary cells. Methylphenidate did not impair fertility in male or female mice that were fed diets containing the drug in an 18-week Continuous Breeding study. The study was conducted at doses up to 160 mg/kg/day. Daytrana was demonstrated to be effective in the treatment of Attention Deficit Hyperactivity Disorder (ADHD) in two (2) randomized double-blind, placebo-controlled studies in children aged 6 to 12 years and one (1) randomized, double-blind, placebo-controlled study in adolescents aged 13 to 17 years who met Diagnostic and Statistical Manual (DSM-IV-TR®) criteria for ADHD. The patch wear time was 9 hours in all three (3) studies. In Study 1, conducted in a classroom setting, symptoms of ADHD were evaluated by school teachers and observers using the Deportment Subscale from the Swanson, Kotkin, Agler, M-Flynn, and Pelham (SKAMP) rating scale which assesses behavior symptoms in the classroom setting. Daytrana was applied for 9 hours before removal. There was a 5-week open-label Daytrana dose optimization phase using dosages of 10, 15, 20, and 30 mg / 9 hours, followed by a 2-week randomized, double-blind, placebo-controlled crossover treatment phase using the optimal patch dose for each patient or placebo. The mean differences between Daytrana and placebo in change from baseline in SKAMP Deportment Scores were statistically significant in favor of Daytrana beginning at 2 hours and remained statistically significant at all subsequent measured time points through 12 hours after application of the Daytrana patch. In Study 2, conducted in the outpatient setting, Daytrana or placebo was blindly administered in a flexible-dose design using doses of 10, 15, 20, and 30 mg / 9 hours to achieve an optimal regimen over 5 weeks, followed by a 2-week maintenance period using the optimal patch dose for each patient. Symptoms of ADHD were evaluated by the ADHD-Rating Scale (RS)-IV. Daytrana was statistically significantly superior to placebo as measured by the mean change from baseline for the ADHD-RS-IV total score. Although this study was not designed specifically to evaluate dose response, in general there did not appear to be any additional effectiveness accomplished by increasing the patch dose from 20 mg / 9 hours to 30 mg / 9 hours. In Study 3, conducted in the outpatient setting, Daytrana or placebo was blindly administered in a flexible-dose design using doses of 10, 15, 20, and 30 mg / 9 hours during a 5-week dose-optimization phase, followed by a 2-week maintenance period using the optimal patch dose for each patient. Symptoms of ADHD were evaluated using the ADHD-Rating Scale (RS)-IV. Daytrana was statistically significantly superior to placebo as measured by the mean change from baseline in the ADHD-RS-IV total score. American Psychiatric Association. Diagnostic and Statistical Manual of Mental Disorders. 4th ed. Washington, DC: American Psychiatric Association 1994. Daytrana is supplied in a sealed tray or outer pouch containing 30 individually pouched patches. See the chart below for information regarding available strengths. *Nominal in vivo delivery rate per hour in children and adolescents when applied to the hip, based on a 9-hour wear period. **Methylphenidate content in each patch. Store at 25° C (77° F); excursions permitted to 15-30° C (59-86° F) [see USP Controlled Room Temperature]. Do not store patches unpouched. Do not store patches in refrigerators or freezers. Once the sealed tray or outer pouch is opened, use contents within 2 months. Apply the patch immediately upon removal from the individual protective pouch. For transdermal use only. Advise patients to read the FDA-approved patient labeling ( Medication Guide). Advise patients of the possibility of a persistent loss of skin pigmentation at, around and distant from the application site. Advise patients to immediately inform their healthcare provider if changes in skin pigmentation occur [ see Warnings and Precautions (5.7)]. Parents and patients should be informed to apply Daytrana to a clean, dry site on the hip, which is not oily, damaged, or irritated. The site of application must be alternated daily. The patch should not be applied to the waistline, or where tight clothing may rub it. If patients or caregivers experience difficulty separating the patch from the release liner or observe tearing and/or other damage to the patch during removal from the liner, the patch should be discarded according to the directions provided in this label, and a new patch should be applied [ see Dosage and Administration (2.3)] . Patients or caregivers should inspect the release liner to ensure that no adhesive containing medication has transferred to the liner. If adhesive transfer has occurred, the patch should be discarded. Daytrana should be applied 2 hours before the desired effect. Daytrana should be removed approximately 9 hours after it is applied, although the effects from the patch will last for several more hours. Daytrana may be removed earlier than 9 hours if a shorter duration of effect is desired or late day side effects appear. 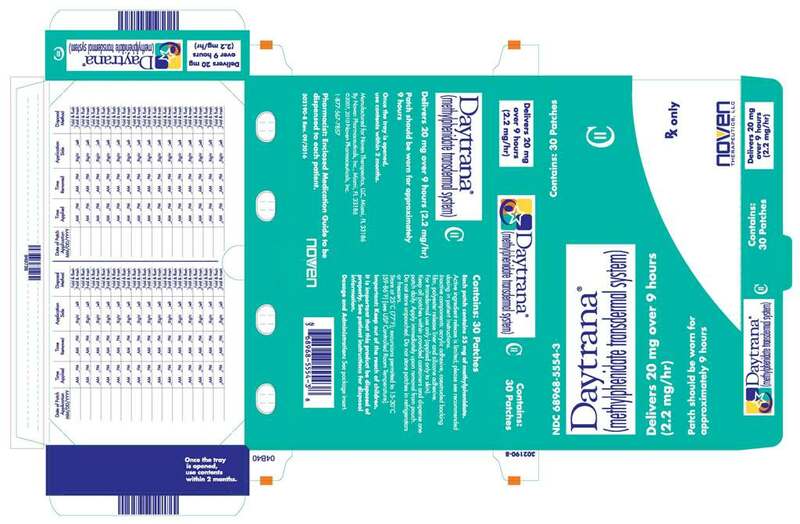 The parent or caregiver should be encouraged to use the administration chart included with each carton of Daytrana to monitor application and removal time, and method of disposal. 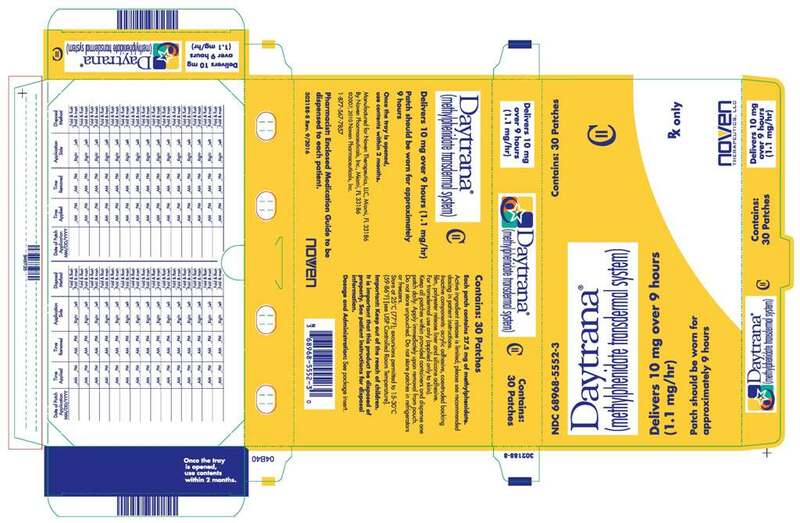 The Medication Guide included at the end of this insert also includes a timetable to calculate when to remove Daytrana, based on the 9 hour application time. Patients or caregivers should avoid touching the adhesive side of the patch during application, in order to avoid absorption of methylphenidate. If they do touch the adhesive side of the patch, they should immediately wash their hands after application. In the event that a patch does not fully adhere to the skin upon application, or is partially or fully detached during wear time, the patch should be discarded according to the directions provided in this label, and a new patch should be applied [ see Dosage and Administration (2.3)] . If a patch is replaced, the total recommended wear time for that day should remain 9 hours, regardless of the number of patches used. Patches should not be applied or re-applied with dressings, tape, or other common adhesives. Exposure to water during bathing, swimming, or showering can affect patch adherence. Do not cut patches. Only intact patches should be applied. If there is an unacceptable duration of appetite loss or insomnia in the evening, taking the patch off earlier may be attempted before decreasing the patch dose. Skin redness or itching is common with Daytrana and small bumps on the skin may also occur in some patients. If any swelling or blistering occurs the patch should not be worn and the patient should be seen by the prescriber. Patients or caregivers should not apply hydrocortisone or other solutions, creams, ointments, or emollients immediately prior to patch application, since the effect on patch adhesion and methylphenidate absorption has not been established. The potential adverse effects of topical corticosteroid use during treatment with Daytrana are unknown. Stimulants may impair the ability of the patient to operate potentially hazardous machinery or vehicles. Patients should be cautioned accordingly until they are reasonably certain that Daytrana does not adversely affect their ability to engage in such activities. Patches should be stored at 25 degrees Celsius (77 degrees Fahrenheit) with excursions permitted that do not exceed 15 to 30 degrees Celsius (59 to 86 degrees Fahrenheit) [ see How Supplied/Storage and Handling (16)] . Patients or caregivers should be advised not to store Daytrana in the refrigerator or freezer. Prescribers or other health professionals should inform patients, their families, and their caregivers about the benefits and risks associated with treatment with Daytrana and should counsel them in its appropriate use. A patient Medication Guide is available for Daytrana. The prescriber or health professional should instruct patients, their families, and their caregivers to read the Medication Guide and should assist them in understanding its contents. Patients should be given the opportunity to discuss the contents of the Medication Guide and to obtain answers to any questions they may have. The complete text of the Medication Guide is reprinted at the end of this document. Manufactured for: Noven Therapeutics, LLC, Miami, FL 33186. By: Noven Pharmaceuticals, Inc., Miami, FL 33186. For more information call 1-877-567-7857 or visit www.daytrana.com. Dot Matrixâ„¢ is a trademark of Noven Pharmaceuticals, Inc.
Daytrana® is a registered trademark of Noven Therapeutics, LLC. © 2009, 2013, 2015, 2016 Noven Pharmaceuticals, Inc. This product is covered by US patents including for use with 6,905,016 and 8,186,506. Daytrana is a federally controlled substance (CII) because it can be abused or lead to dependence. Keep Daytrana in a safe place to protect it from theft. Selling or giving away Daytrana may harm others and is against the law. Tell your doctor if you have ever abused or been dependent on alcohol, prescription medicine or street drugs. What is the most important information I should know about Daytrana? Your doctor should check you carefully for blood pressure and heart problems before you start and while you are using Daytrana. Tell your doctor right away if you have any new or worsening mental problems while using Daytrana. Daytrana is a prescription medicine used to treat Attention Deficit Hyperactivity Disorder (ADHD) in people 6 to 17 years old. Daytrana is a central nervous system (brain) stimulant medicine. Daytrana may help you have better attention and less impulsive and hyperactive behavior. Daytrana is a patch that you apply to your skin on your hip. Daytrana is used as part of a total treatment program for ADHD that may also include counseling or other treatments. It is not known if Daytrana is safe and effective in children younger than 6 years. Who should not use Daytrana? are taking or have taken a monoamine oxidase inhibitor (MAOI) medicine within the past 2 weeks. Do not take a MAOI medicine for at least 2 weeks before using Daytrana. Ask your doctor or pharmacist if you are not sure if any of your medicines are MAOIs. are allergic to methylphenidate or any other ingredients in Daytrana. See "What are the ingredients in Daytrana?" for a complete list of ingredients. What should I tell my doctor before using Daytrana? are pregnant or plan to become pregnant. It is not known if Daytrana will harm your unborn baby. Talk to your doctor if you are pregnant or plan to become pregnant. are breast feeding or plan to breast feed. It is not known if Daytrana passes into your breast milk. You and your doctor should decide if you will use Daytrana or breastfeed. Tell your doctor about all of the medicines you take, including prescription and over-the-counter medicines, vitamins, and herbal supplements. Daytrana and certain other medicines may affect each other, causing serious side effects. a monoamine oxidase inhibitor (MAOI) medicine See "Who should not take Daytrana?" Know the medicines that you take. Keep a list of them to show your doctor and pharmacist. Do not start any new medicine while using Daytrana without talking to your doctor first. How should I use Daytrana? Read the Patient Instructions for Use at the end of this Medication Guide that comes with your Daytrana for information about the right way to use Daytrana. Parents or caregivers should apply and remove Daytrana for their child if the child is not responsible enough to do so. Do not wear your Daytrana patch longer than 9 hours. If you accidentally apply or wear more than 1 patch at a time, you have used too much Daytrana. Remove all patches, wash the application sites right away and call your doctor. What should I avoid while using Daytrana? Do not put any medicine, cream, or lotion on your hip before you apply the Daytrana patch. Medicines, creams or lotions may affect how the patch sticks to your skin and how the medicine is absorbed from the patch. Do not use bandages, tape, or other household adhesives (glue) to hold the patch onto your skin. Do not use hair dryers, heating pads, electric blankets, heated water beds or other heat sources while wearing a Daytrana patch. Too much medicine can pass into your body and cause serious side effects. Do not drive, operate heavy machinery or do other dangerous activities until you know how Daytrana affects you. What are possible side effects of Daytrana? See "What is the most important information I should know about Daytrana?" Seizures. This usually happens in people with a history of seizures. Slowing of growth (weight and height). You should have your height and weight checked while using Daytrana. Loss of skin color (chemical leukoderma). Daytrana may cause a persistent loss of skin-color where the patch is applied or around the patch application site. Loss of skin-color, in some cases, has been reported at locations on the skin far from any application site. The loss of your skin-color may be permanent even after removing the patch or stopping use of Daytrana. Call your doctor immediately if you have changes in your skin-color. Allergic skin rash. Stop using Daytrana and see your doctor right away if you have swelling or blisters at or around the application site. You may have a skin allergy to Daytrana. People who have skin allergies to Daytrana may develop an allergy to all medicines that contain methylphenidate, even those methylphenidate medicines that are taken by mouth. These are not all the possible side effects of Daytrana. For more information, ask your doctor or pharmacist. How should I store Daytrana? Store Daytrana at room temperature between 68° F to 77° F (20° C to 25° C). Do not store Daytrana in the refrigerator or freezer. 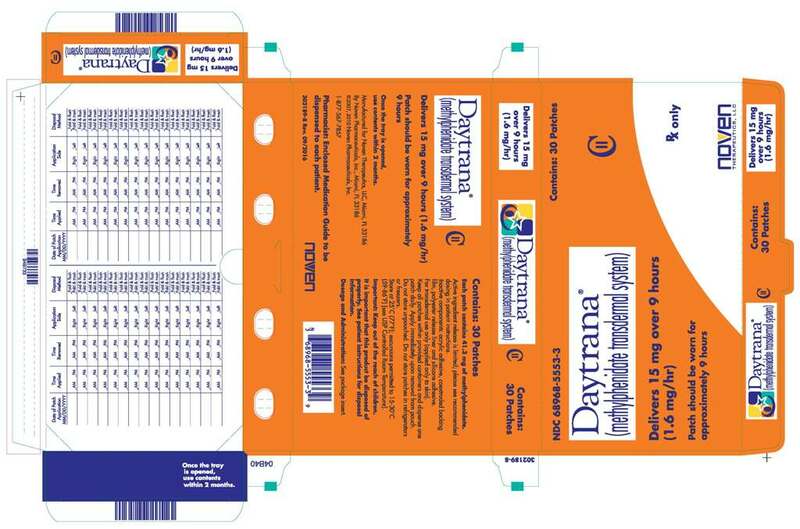 Keep Daytrana patches in their unopened pouches until you are ready to use them. Use or throw away the patches within 2 months after you open the sealed tray or outer pouch. Keep Daytrana and all medicines out of the reach of children. General information about the safe and effective use of Daytrana. Medicines are sometimes prescribed for purposes other than those listed in a Medication Guide. Do not use Daytrana for a condition for which it was not prescribed. Do not give Daytrana to other people, even if they have the same symptoms that you have. It may harm them and it is against the law. This Medication Guide summarizes the most important information about Daytrana. If you would like more information, talk with your doctor. You can ask your doctor or pharmacist for information about Daytrana that is written for health professionals. For more information, go to www.daytrana.com, or call 1-877-567-7857. What are the ingredients in Daytrana? Each day, when a new Daytrana patch is applied to your hip, write down the date and time that you applied the patch. Use the Daytrana schedule below so you can decide when to remove the patch. For example, if the patch is applied to the skin at 6:00 a.m., remove the patch at 3:00 p.m. on the same day. After you remove and throw away the patch, write down the time you removed the patch and how and where you threw it away. Apply patch to your hip area. Do not put the patch near your waist. Clothing and movement may make your patch rub off (See Figure A). Use your other hip when you apply a new patch the next morning. Make sure there is no redness, small bumps or itching at the site where the patch is going to be applied. Does not have any cuts and irritation (rashes, inflammation, redness, or other skin problems). Open the sealed tray or outer pouch and throw away the small packet (drying agent). Each patch is sealed in its own protective pouch. 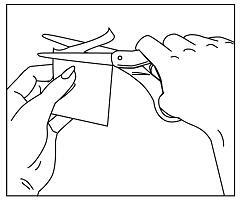 Carefully cut the protective pouch open with scissors, being careful not to cut the patch. Do not use patches that have been cut or damaged in any way (See Figure B). Remove the patch from the protective pouch. Look at the patch to make sure it is not damaged. The patch should separate easily from the protective liner. Throw away the patch if the protective liner is hard to remove. 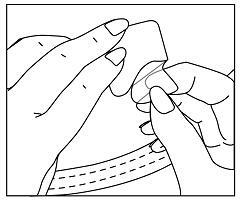 Protective liner: The protective liner is the layer that you remove before you put the patch on (See Figure C). Adhesive with medicine: The adhesive with medicine is the layer that sticks to your skin (See Figure C). Outside backing: The outside backing is the layer that you see after you put the patch on your skin. The word "Daytrana" is printed on this layer (See Figure D). Apply the patch right away after you remove the patch from protective pouch. Hold the patch with the hard protective liner facing you. The word Daytrana will appear backwards. Gently bend the patch along the faint line and slowly peel half the liner, which covers the sticky surface of the patch (See Figure E). If you accidentally touch the sticky side of the patch, apply the patch, then wash your hands right away so that the medicine does not go into the skin on your hands. Using the other half of the protective liner as a handle, apply the sticky side of the patch to the selected area of the child's hip (See Figure F). Press the sticky side of the patch firmly into place and smooth it down. While you are still holding the sticky side down, gently fold back the other half of the patch. Hold an edge of the remaining protective liner and slowly peel it off (See Figure G). After the protective liner is removed, there should not be any adhesive (glue) sticking to the liner. Press the entire patch firmly into place with the palm of your hand over the patch for about 30 seconds (See Figure H). Make sure that the patch firmly sticks to your skin. Gently rub the edges of the patch with your fingers to make sure the patch sticks to your skin. Wash your hands after you apply your patch. Write the time you applied your patch on the dosing chart on the carton. Use the dosing schedule so you know what time you should remove your patch. Gently apply an oil-based product (petroleum jelly, olive oil, or mineral oil) to the patch edges. Gently spread the oil underneath the patch edges. If you still can not easily remove the patch, ask your doctor or pharmacist about what to do for this problem. 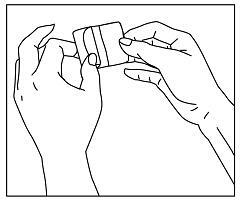 Fold the used Daytrana patch in half and press it together firmly so that the sticky side sticks to itself. Flush the used patch down the toilet or put the patch in a container with a lid right away. Do not flush the protective pouches or the protective liners down the toilet. These items should be thrown away in a container with a lid. Wash your hands after you handle the patch. After you remove the patch and throw the patch away, write down the time on the dosing chart. Safely throw away any unused Daytrana patches that are left over from the prescription as soon as they are no longer needed. Remove the leftover patches from their protective pouches and remove the protective liners. Throw the patches away in a container with a lid.